In Garden City, Michigan, in 1993, Chuck "Tramp" Dare and Bill "Polka" Kaledas, commander of American Legion Post 396, shared an idea to start a motorcycle enthusiasts association within the organization. At a regular meeting, Post 396 members passed a resolution for a new program to be known as the "American Legion Riders." Currently, 106,000 American Legion Riders meet in over a thousand chapters in every domestic department and in at least three foreign countries. Riders in Iowa have formed an honor guard called The Five Star Freedom Riders, and Riders in Mulvane, Kansas, founded the Patriot Guard to protect the sanctity of military funerals from protesters. Riders in all states have escorted military units returning home from combat tours overseas, conducted massive cross-country fundraising events for wounded warriors from all services, and have raised millions of dollars for countless local, state and national charities. 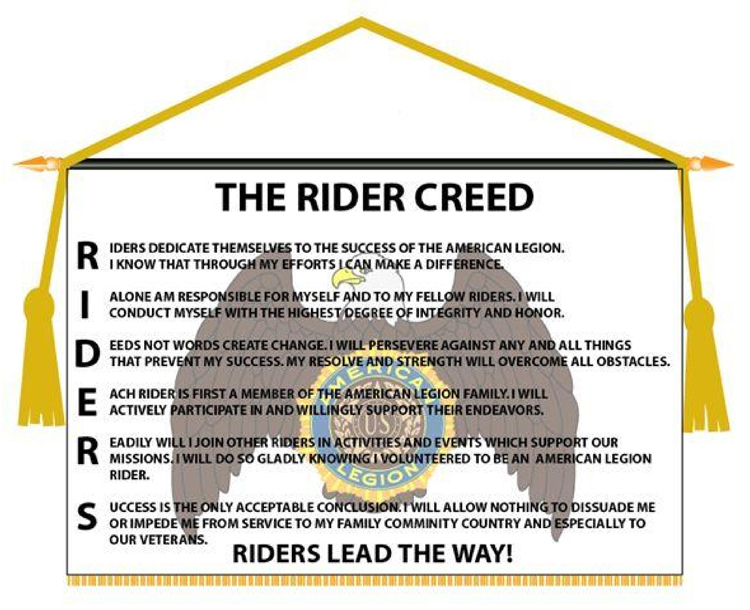 The mission of the American Legion Riders is to promote and support the programs of the American Legion and to participate in parades and other ceremonies which are in keeping with the Aims and Purposes of the American Legion. It promotes motorcycle safety programs and provides a social atmosphere for American Legion members who share the same interest. Must hold membership in and be in good standing with The American Legion, American Legion Auxiliary or Sons of The American Legion. Must own a legally registered motorcycle or be the legally registered owner's spouse within the state of registration. All operators must obey motor-vehicle laws in the state in which they are operating a motorcycle or riding as a passenger. There may be additional requirements that vary from chapter to chapter.